Last year, my sister came to me with an idea to do something a bit different and challenging every year together. Part of the reason for this was because we practically used to live in each other’s pockets (terrible sibling rivalry when we were growing up was transformed into a true friendship when she came to work with me in the theatre restaurant I owned and ran back in my twenties), but life and obligations to children, spouses and work means we don’t see each other as often we used to (although, we still see each other every week – some would say that’s enough, but we really are good friends!) The other reason is because there are things she wants to do that she can’t do with her hubby, partly because he has an injury which stops him from doing a lot of things, but also because he’s not inclined to do things to get your blood rushing in that way. She also wanted to show our children that you can do whatever you want when you put your mind to it. I thought it was a great idea, so, last year, we went on our first special outing together – a face first abseil down a 6 story building. We did it 3 times that day, each time just as scary but better than the last. Without meaning to sound like I’m tooting our horn, the man who ran it said we were the best at doing it he’d seen for a while. Not bad for 2 forty-year old mums! 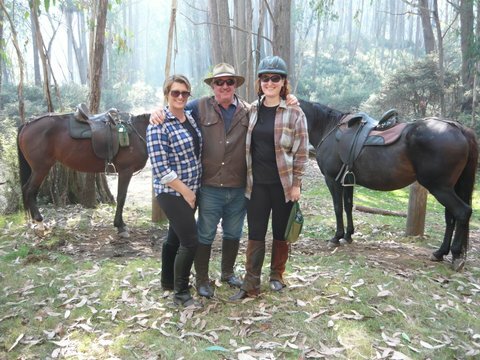 When I was 14 I went on a 5 day horse riding trek with my Uncle Richard (who is a horse enthusiast too – the only one in my family at the time) starting from Omeo and riding through the Bogong High Plains, camping out near old stockmans’ cottages every night. We rode up and down mountains, through the plains near the top of Fall’s Creak and down through the riverlands. It was an amazing experience we still talk about today. At the time, my younger sister wasn’t really interested in horse riding and showed no interest in coming with us. Cut to 30 years later, six years of holiday horse riding camps down near Anglesea when we were at school and a few other rides besides, a damaged knee (me), a dislocated shoulder (her), marriage and children (both of us) and bodies showing the wear and tear of age and an active and sometimes reckless approach to our sports, and she suddenly decided a trek like I went on when I was 14 was just the thing, complete with Uncle Richard – who had given up city life years ago to live in the country and still horserides. So we approached him with the idea. Of course he was really keen to do it. My sister found a place called Buckle Up Bushrides near Merijig who were able to do a 4 day ride at a time that suited us all. We booked in, bought new riding boots and jodhpurs and were off. 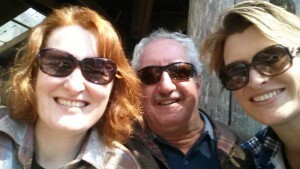 We met Uncle Richard in Merijig the night before the ride and had a great country meal at the Merijig Inn and were sleeping in bunk rooms that reminded me of staying up at the snow. 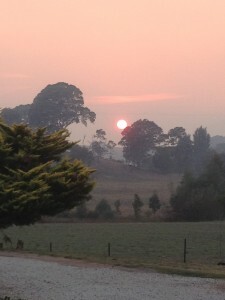 The next day we got up to a red sun and the smell of smoke – they were back burning up in the mountains – and headed to the Buckle Up Bushrides farm. It has been 18 years since I rode a horse and since I’ve truly been around horses like that, but the moment I got out of the car, I felt like I was home. The scent of horses and paddocks, the dust and smoke in the air, the sound of whickers and hooves pounding the earth in the distance, were all sounds and scents I’d experienced many times before and made me feel instantly relaxed. We had met the trail bosses the night before at the pub – Paul and Shelley, a really lovely couple – and then met the rest of the crew, Paul’s mum, Kay who was the camp cook, and Geoff who was Paul’s hand and camp supervisor. We met one of the others riders – the other wasn’t arriving until lunch and would be brought in by Paul in the 4WD), packed our gear into their trucks and then set off up the mountains in the 4WDs. 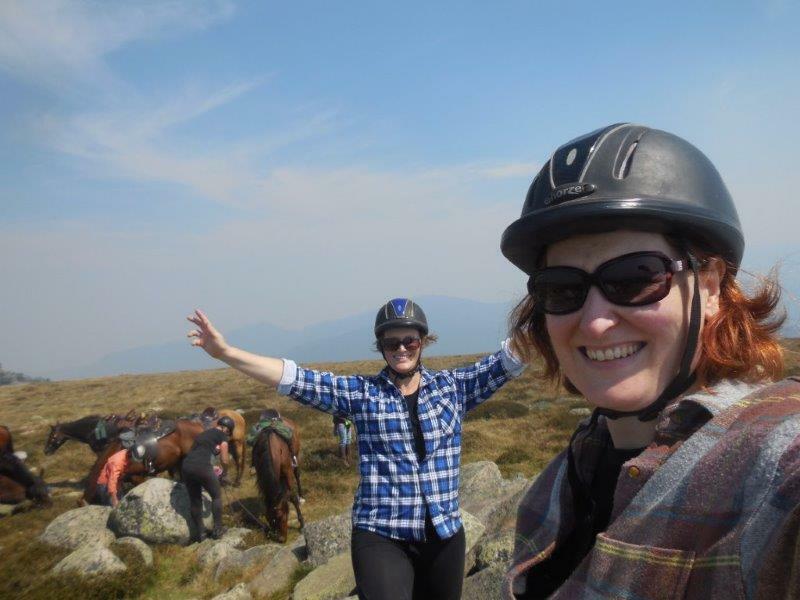 The horses had been trucked part way up Mt Stirling which was our start off point and where we met the other trail supervisor, Karen. We met our horses, and because all of us had a lot of previous experience riding, mounted up and headed off. 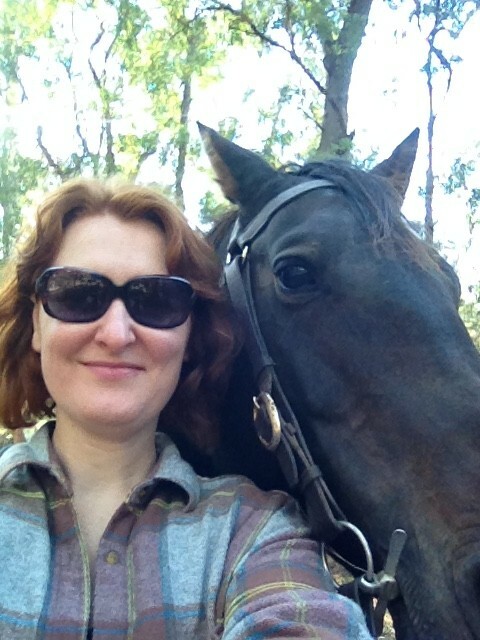 I can’t tell you how fantastic it felt to be on a horse again. My sister and I were quite worried about sore muscles, and even though we did have them, it wasn’t anywhere near as bad as we thought it was going to be. It was like the old riding a bike cliche. 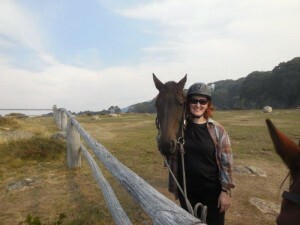 I remembered everything right away and my horse, Chelsea, was lovely, and after testing me to start off with, caught on that I was experienced and wasn’t going to let her get away with the kind of stuff she might try on a less experienced writer, and we settled down into a partnership right away. 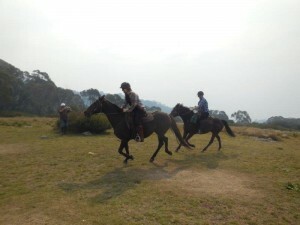 That’s what this kind of horse riding is all about – a partnership between rider and horse. If you don’t respect each other, the ride is not nearly as enjoyable. Chelsea was doing a lot of the hard work – that first day was a lot of riding up steep hills – but it was my job to get up off the saddle on the steep parts and trust her ability to take the best path for her and me, looking after her so she could look after me, and it was her job to take my instruction when necessary. The first few hours were spent figuring each other out and after that, it was pretty smooth riding. She was a really good horse. We rode through really rugged country up to the top of Mt Stirling on that first day. 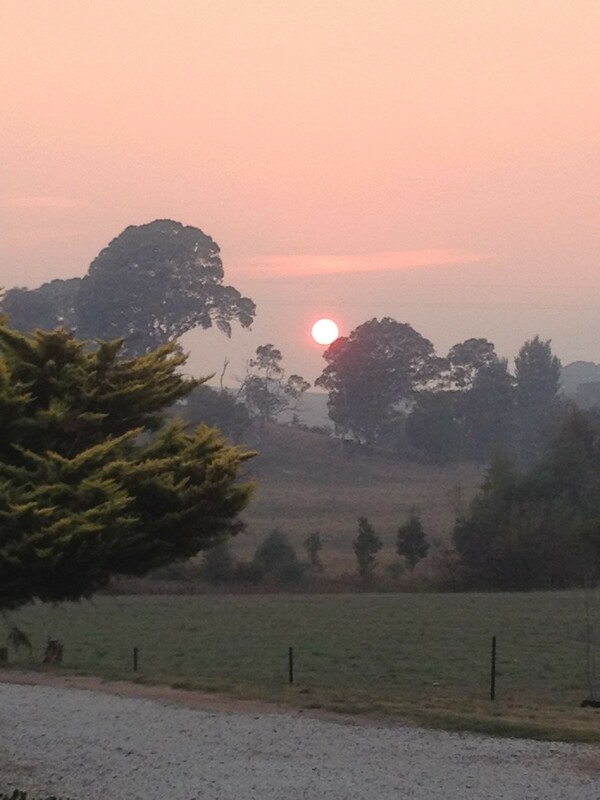 Very unfortunately, the backburning meant that there was smoke obscurring the view that would normally be fabulous, but we had a lot of laughs as we peered through it, trying to make out the village on Mt Buller (only just) and the other mountains surrounding there. I had never been up Mt Stirling before, but had viewed it many times skiing on Mt Buller – so it was kind of cool to see the view (what we could see) from the other highest point in the area. 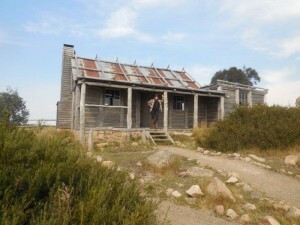 Craig’s Hut which was built there for the movie – although, the one that’s there now is just a replica as the original was burnt down a number of years ago in bushfires. 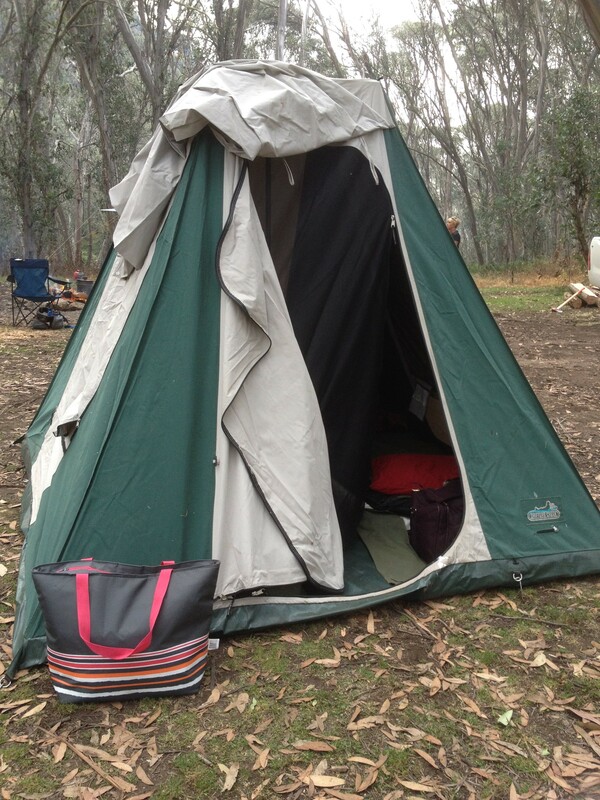 We all got back to camp, looked after the horses first as any good horseperson will do, and then my sister and I set up a tent for ourselves, rolled out our swags – first time I’ve ever slept in a swag – and settled down around the camp fire, swapping stories, having a good meal and just taking in the relaxing atmosphere that I only ever really find in the mountains. I think I must be a mountain girl at heart. Given I’ve got so much to say on this amazing adventure, I’m going to split this blog into 2 parts. So, this is enough for now. Next week I’ll cover the rest of the trip – but I will say this now. If you are thinking of going on a horseriding trek in the mountains, the crew at Buckle Up Bushrides are fantastic. 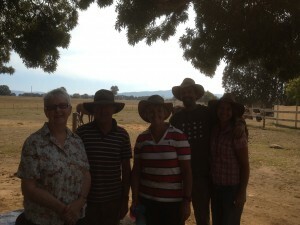 They love their horses and what they do and are incredibly friendly and helpful. 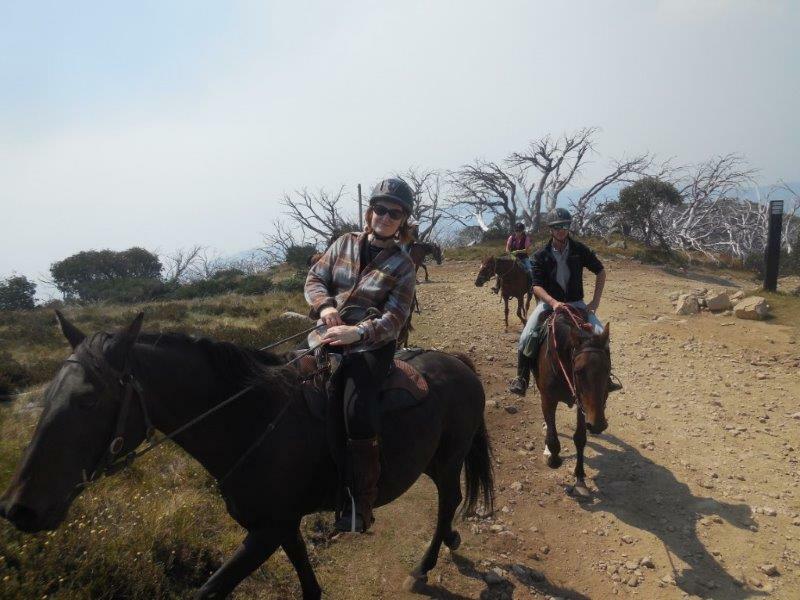 They are a relatively new company up there, but they have been working with some of the biggest trail rides up there (Kay is a Lovick – one of the big cattle families in the region and the family made famous for their work on The Man from Snowy River) and really know the mountains. I want to do this again with my family some time in the future and I will most definitely be doing it with them. Enough said for now – next week I’ll be talking about the challenging trails we did on day 2 and 3 and the excitement when one of the trail bosses had a spill off a very narrow, high track above the Howqua river. Sounds like a plan, Liz.